More and more businesses are offering their employees the opportunity to work remotely, and it’s easy to see why. Remote work offers increased flexibility as well as savings on commute time and cost for the employee, while the employer can potentially reduce overhead expenses while accessing a much wider pool of talent. However, time and cultural differences as well as an “out of sight, out of mind” attitude can hinder communications and productivity among a geographically dispersed team. Managing employees from a distance can be challenging, but with the right approach, you can create an efficient, productive team, regardless of where individual team members are located. We asked a panel of Young Entrepreneur Council members how business owners can make the most of a remote workforce. 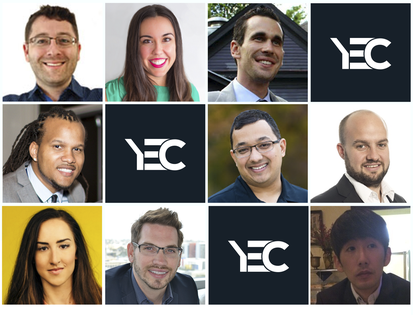 Members of Young Entrepreneur Council offer advice on building an effective remote workforce.All photos courtesy of YEC members. When running a remote team, having weekly team meetings will help keep everyone on the same page. It also helps to use cloud-based software for project management. I prefer Confluence by Atlassian, which allows you to tag teammates in comments and document best practices, and it can be accessed from any computer with a Wi-Fi connection. It also helps to have one face-to-face meetup with team members at least once a year. We’re social creatures, and virtual meetings don’t allow for as much creativity and masterminding as in-person meetups do. – Brian David Crane, Caller Smart Inc.